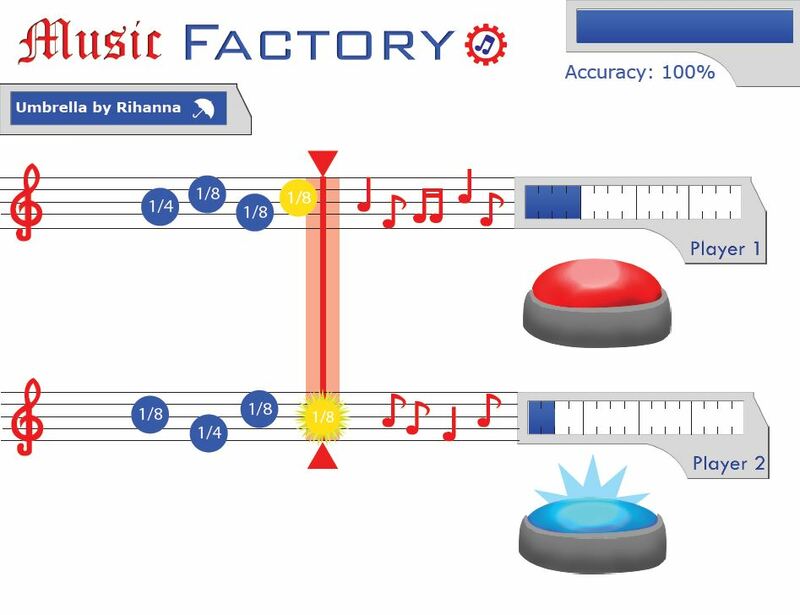 Music Factory is a single to multi-player game that combines fractions, decimals, and percentages with music to help students make connections between musical notes and mathematics. Songs from popular culture are implemented into Music Factory to get students excited about the music they are playing. Students are given a series of musical notes for a song that have been translated into either fractions, decimals, percentages, or a combination of the three that scroll across the screen towards an arrow. Once the number hits that arrow, the students’ goal is to hold down their button until a bar fills to the same length of the number. For example, if the student is given either 1/2, .5, or 50%, they would want to hold their button until the bar filled halfway. If successful, the number will turn back into a note. If the student gets 70 percent of the notes correct, the piece of music they have translated will play for them. The game is designed for up to three players with the notes split into three sections. Each player is given a different set of notes to play and when combined, make up the entirety of a section of music from a song.